Easy Pizza Pasta Casserole is the perfect quick dinner recipe! Pasta topped with sauce, mozzarella cheese, and your favorite pizza toppings. 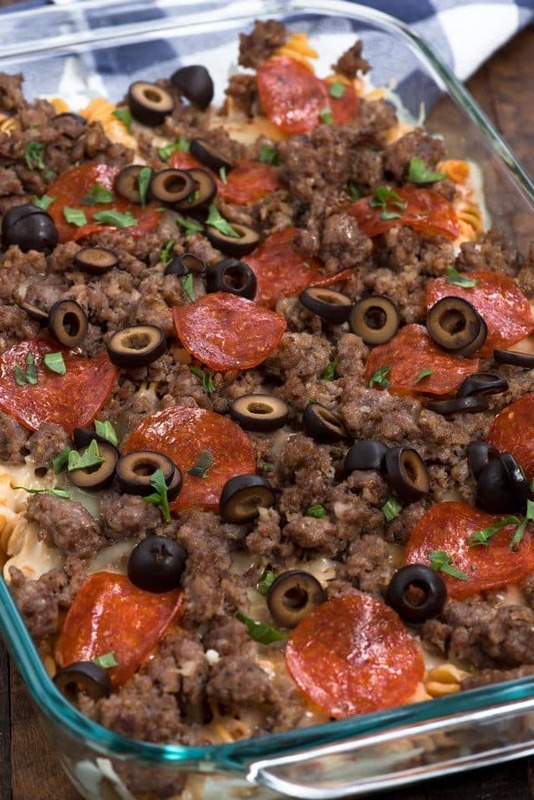 Even picky eaters love this casserole recipe! Through blogging, I’ve met a ton of amazing women, several of whom I consider very good friends or sisters. But it’s also important to have local friends that you can see and talk to face-to-face on a regular basis. I’ve never been great at making friends and as an adult it’s even harder, but I have a tribe of women here that are really amazing. We’ve all known each other since our kids were in Kindergarten and even if we don’t see or talk to each other every day now, we still know we have each other’s backs. I think one of the nicest things we all do for each other is the dinner train. Whether a husband has surgery or a mom is sick or a family member dies, we know we can count on each other for a meal in a time of need. When Mel had his surgery in June I had meals delivered to me every other day for two weeks and it was a total lifesaver. This pizza pasta casserole came about because of the dinner train. A friend lost her mom and had to go out of town, leaving a husband and three very hungry boys behind. I knew that because I was feeding 4 hungry guys that I’d need to send something hearty and filling, and a casserole is just that. Everyone loves pizza night, so why not turn pizza into pasta? 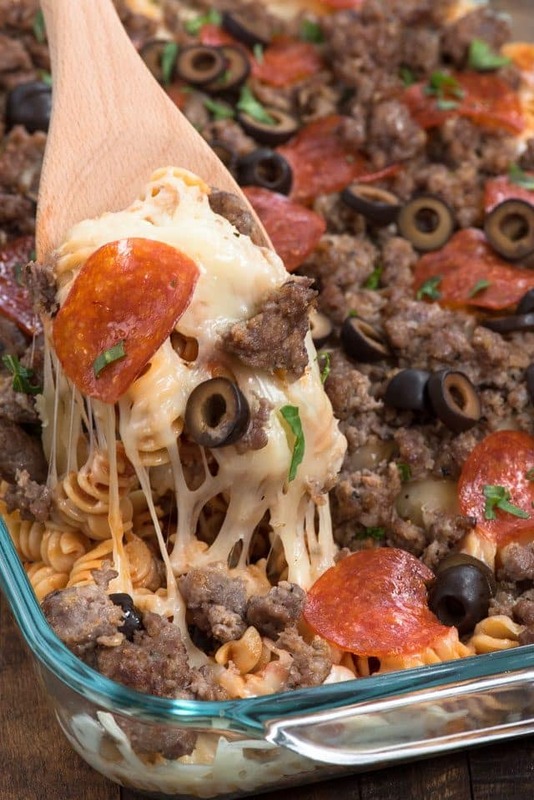 This easy baked casserole has all your favorite pizza toppings sprinkled over pasta! You can make this easy pizza pasta bake with sausage or pepperoni or any of your favorite pizza toppings! I started out this casserole with some bulk Italian sausage. All you have to do is brown it up and drain it and it’s ready to top your casserole. Want to use turkey sausage instead of pork? Go ahead! We love using turkey sausage! 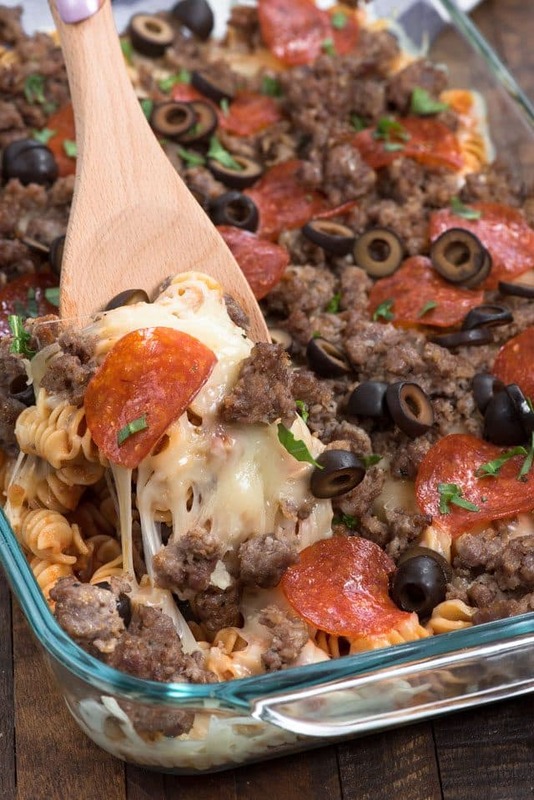 The only other thing you have to do to make this pizza pasta casserole is to boil the pasta. I used a rotini pasta because I like how the ridges catch the pasta sauce, but you could easily use any kind of pasta shape you want. Coat your pasta in marinara sauce and then pile on the toppings! What toppings do you put on pizza pasta? The beauty is you can use any you like! Pick your favorite pizza toppings and you have the best ever pizza pasta casserole! Just don’t forget the loads of mozzarella cheese. If using Italian sausage, place in frying pan and cook, breaking up the meat as you cook, over medium heat, until cooked through and no longer pink. Drain well on paper towels. Toss pasta with jar of pasta sauce. Pour into a 9x13-inch casserole dish. Top with cheese, Italian sausage, and any other pizza toppings (i.e. pepperoni, olives, bell pepper, etc). Bake until cheese is melted, about 10-15 minutes. Serve hot. 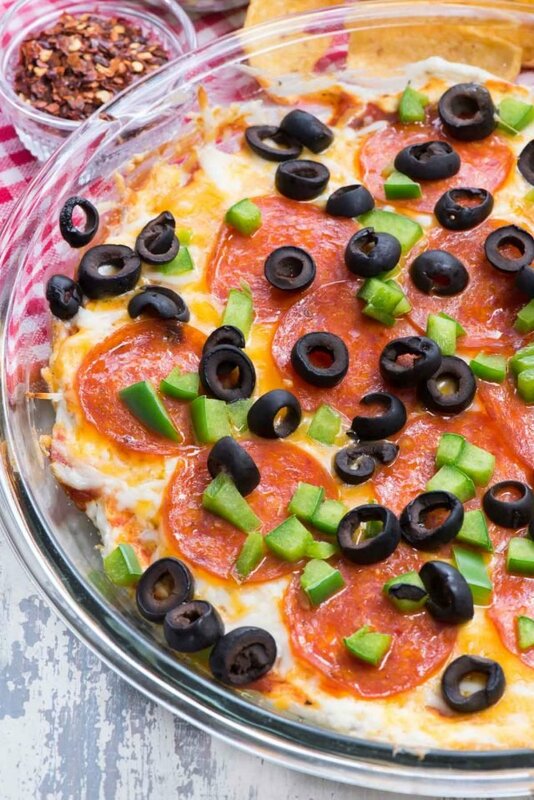 Pizza Dip is perfect for parties! 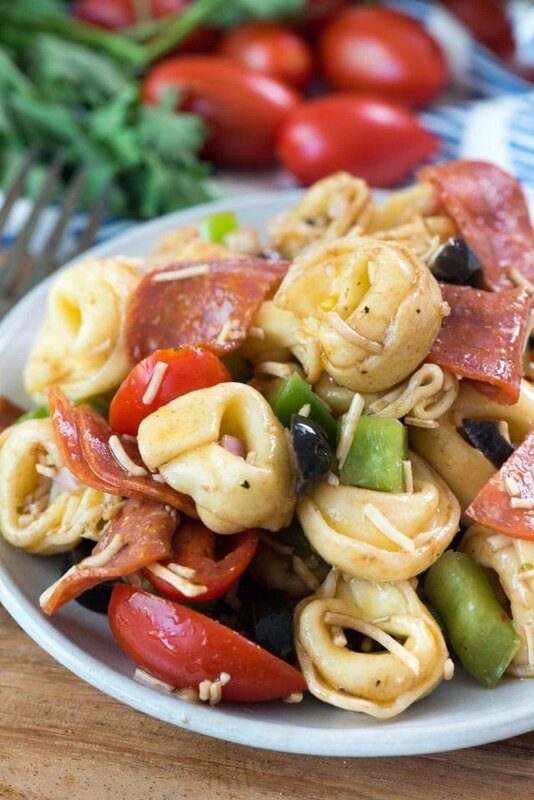 Pizza Tortellini Salad is my favorite pasta salad! 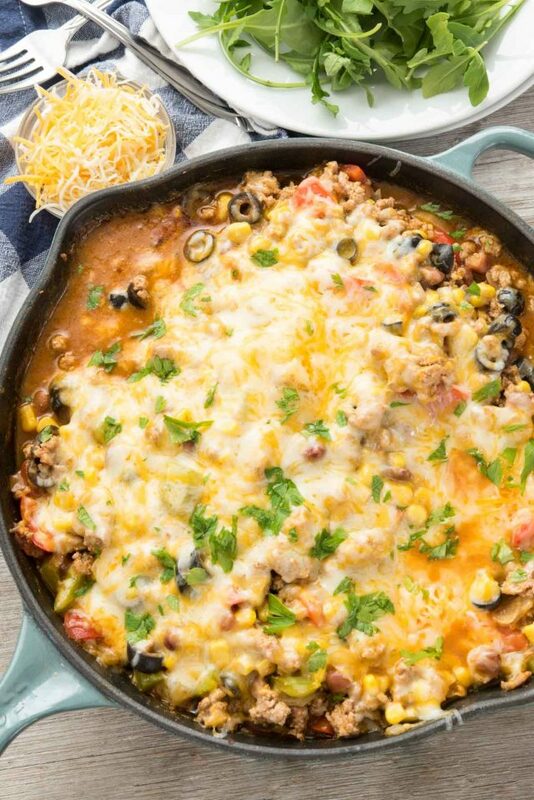 One Pot Taco Casserole is another easy weeknight meal. This is such a fantastic idea! It combines two of my favourite Italian dishes into a single dish, and I love how it’s so easy to make! So into Italian ! Thank you very much !